Jenson Button has pledged £15,000 to a fundraising page set up to support a British Formula 4 driver who had both legs amputated following a crash. 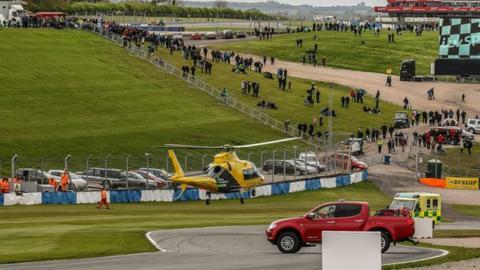 Billy Monger, 17, drove at high speed into the back of a car which seemed to have stopped on the track during Sunday's race at Donington Park. Lewis Hamilton has also offered support, tweeting: "Thoughts and prayers are with you and your family." More than £500,000 had been raised by 13:00 BST on Thursday. Monger, who has been described as "an extremely talented young driver" had to be extracted from his vehicle at the Leicestershire track and airlifted to hospital. Button, the 2009 world champion who retired last year but will make a one-off outing for McLaren at next month's Monaco Grand Prix, was among the first to voice his support for Monger. "This guy needs our help. I will be doing as much as I can to help this dude out," he wrote on Instagram. Red Bull's Max Verstappen also appeared to make a pledge on the page, tweeting: "Really shocked about Billy Monger's terrible accident. If you can, please join me in helping him out." Donations also appeared to be made by former F1 drivers Max Chilton, Karl Wendlinger and Andre Lotterer, as well as touring car driver Jason Plato and American Nascar racer AJ Allmendinger. Williams' Brazilian driver Felipe Massa showed his support on Twitter, writing: "Let's help him. I'll do my best." Ex-F1 driver Mark Webber wrote "keep boxing mate", while the Mercedes, Force India and McLaren teams have also showed their support on social media. Steven Hunter, head of the team JHR Developments that Monger has been with for the past four years, said it had been a "heart-wrenching" time. "We saw the crash and our fears were as low as they could be," he said. "But everything has been in the right direction since. "Yesterday we lined everyone up and just took some time to wish him well. The pipes are out of his mouth and he spoke. He was hoarse but he just about spoke."